Intelligent Green Building Solutions for Indoor Environment Quality! The Joint Committee on Energy and Environmental Policy is made up of more than 25,000 technicians working for over 600 contractors throughout California. Our quality control and specialized training enhance your reputation; call us for solutions to your Environmental Systems needs. 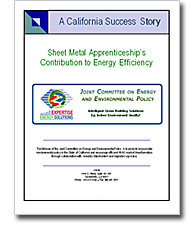 Read our latest paper, Sheet Metal Apprenticeship's Contribution to Energy Efficiency. The Joint Committee on Energy and Environmental Policy is a joint Task Force charged with the responsibility to monitor and influence energy and environmental policy in the State of California as it pertains to and impacts the heating, ventilating & air conditioning (HVAC) industry. The Mission of the Joint Committee on Energy and Environmental Policy is to promote responsible environmental policy in California and encourage efficient HVAC market transformation through collaboration with industry stakeholders and regulatory agencies. Green buildings are not just a fad…they are the future. These buildings increase energy efficiency while reducing environmental problems through better use of design specifications, construction, and maintenance. Career opportunities are available in sustainable building system design, fabrication, balancing, commissioning, service and operations. JCEEP was formed by CAL-SMACNA and California SMWIA Local Unions, who have a well-established relationship geared towards cooperation in training the best workers to do the job. Testing, adjusting, and balancing (TAB) of a building’s heating, ventilation, and air conditioning (HVAC) systems helps make a building green. JCEEP is proud of its affiliation with TABB, the Testing, Adjusting, and Balancing Bureau. TABB is an ANSI Accredited Certification Program, certifying those members who have decided to increase their job opportunities by becoming TABB Certified technicians and supervisors. TABB also certifies contractors and also the actual "TAB labs" across the United States and Canada. These facilities have met stringent requirements that reinforce the professionalism taught at these training centers. For more information, review the list below and contact the nearest training center for more information. JCEEP is a committee formed by California Sheet Metal and Air Conditioning Contractors National Association and the California Local Unions of the Sheet Metal Workers’ International Association assigned to collaborate with the Public Utility Commission, Energy Commission and the Air Resources Board to assist in implementation of their building energy efficiency and green house gas reduction programs. CAL SMACNA and the SMWIA co-sponsor and fund training in 15 different centers located throughout the state. Their training programs offer career paths in HVAC system design, fabrication, installation, balancing, commissioning and service. Whether your interests are in design, detailing, BIM, installation or system efficiency we offer a path to the future. For more information please locate a center in your area from the list below and give them a call. TABB-certified contractors are trained, equipped and capable of carrying out this 10-point process to assure that systems in "green" buildings are performing according to design objectives and/or to provide optimum system performance for sustainability. Verify that fundamental building elements and systems are installed, calibrated and operating as intended to deliver functional and efficient performance. Review the building operation plan to affirm that it meets the requirements of current building usage — with regard to the heating and cooling system, humidity control and building automation controls. Prepare a balancing plan to test the building systems for performance up to specifications or the most efficient possible performance. Report all building systems that are not working according to specifications as stated in the building operation plan. After refitting or repair, re-test all building components to verify operation according to specifications in the building plan, or up to the most efficient possible performance. Provide a summary of current building operation plan, highlighting major building HVAC systems and assemblies. Document that all actions of the HVAC specification requirements have been completed. Provide demonstratively either (a) that the building’s energy performance meets one of the following standards: Energy Star (using Energy Star Target Finder), GBI and USGBC LEED (using the alternate method as described in the “LEED for Existing Buildings Reference Guide”); or, if that rating cannot be achieved, that the building has the most efficient possible performance given its HVAC systems. Aid in implementing energy-efficient retrofits and energy-saving techniques to reduce energy usage to comply with ratings described in 8, or the most efficient possible performance. Provide a third party entity (certified and current with TABB) to test, adjust and balance all building HVAC systems. Our commitment is to provide highly trained and productive workers adept in Energy Expertise to consumers through our Contractors. We have 15 accredited training facilities located throughout California to assure the availability of top notch technicians trained and experienced in total building performance specializing in building energy system analysis and maintenance. Leakage Costs $$ (& Carbon!!) It's the "Green Thing To Do"! James E. Woods, Ph.D., P.E. The primary purpose of the 2008 Nonresidential Standards is “to further reduce growth in electrical and natural gas use and demand in nonresidential buildings while providing improved indoor environmental conditions and reducing greenhouse gasses and other emissions.” To address this purpose, the objectives of this White Paper are to provide an analysis of the impact that the required but limited air leakage testing and validation procedures have on building energy consumption, and to recommend means and methods to improve the procedures that will reduce energy consumption in nonresidential buildings. To achieve these objectives, the Nonresidential Standards and supporting documents were reviewed, other literature was reviewed, and a thermodynamic analysis was conducted.